Every once in a while you hear a stop that absolutely stops you dead in your tracks and this week’s subject did just that to me when I first heard it about 20 years ago. I tuned in one morning to Radio Two’s Sound of the Sixties and heard Brian Matthew play this song and it send a shiver down my spine and any forum’s you read about this song it seems to have the same effect on them too. This week I focus on the anti-nuclear protest song Come Away Melinda. Many have covered this song and its sentiment varies greatly and some even change the gender. The song was co-written by Brooklyn-born guitarist and songwriter Fred Hellerman who was a member of the folk band The Weavers whose heyday was from 1948-1953 when they disbanded but returned on Christmas Eve 1955 with a sell-out concert at Carnegie Hall, New York. The other writer was Frances Minkoff, or Fran as she was known, was an American lyricist. Hellerman was the youngest of three children from parents who were Jewish immigrants from Latvia. After school he served in the US Coast Guard towards the end of the Second World War, before studying for an English degree at Brooklyn College. He taught himself to play the guitar and performed with the dance and song group American Folksay as well as recording with the actor Will Geer. He then met Ronnie Gilbert and Pete Seeger and formed the Weavers, a name suggested by Hellerman, in 1947. A few years ago the blogger Ken Gale met Fred who told him that it was Fran who suggested doing an anti-war anthem and Fred said, “No. Let’s do a song about what war means to one person.” He said he regretted that the song is so hard to sing. The song was first recorded in 1963 by Harry Belafonte and appeared on his album I Have Walked. Judy Collins recorded a duet version with The Byrds’ Jim McGuinn later the same year and then the Weavers recorded their own version. A folk band called The Big Three, not to be confused with the Liverpool trio of the same name, recorded a version in 1964. That Big Three comprised Cass Elliot, Tim Rose and Jim Hendricks. A song had a great effect on Cass Elliot, who later became Mama Cass, and Tim Rose that they both recorded solo versions at a later date. The only version to hit the UK chart was in 1965 by a singer called Barry St. John – a female! Barry was born Elizabeth Thompson in Glasgow c; 1943, Liz, as she was known, enjoyed singing from a young age and school friends urged her to pursue singing as a career. She headed out into the world to promote herself and her first stop was Hamburg, Germany, where she performed at the Star Club. After a few months she returned to the UK, signed a record deal with Decca in 1963 and released Bread and Butter backed with a cover of Solomon Burke’s Cry to Me the following year. It failed to make the UK chart although it did reached the top 40 in Germany. Her next single was a rousing cover of the Shirelles’ A Thing Of The Past backed with a cover of the Jarmels’ A Little Bit of Soap that too failed to entice the record buying public. In 1965 she released the moody Chris Andrews-penned Mind How You Go but that also went unnoticed. 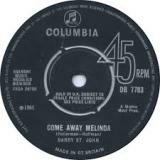 She then changed labels to Columbia and release Come Away Melinda which received healthy airplay on the pirate station Radio London and spent two weeks on their chart. It also made the national chart peaking at number 47. The Harry Belafonte original featured a children’s choir singing the ‘mummy, daddy come and see what I have found’ whereas the Barry St John version has a single little girl singing the slightly altered ‘mummy mummy come and look and see what I have found’, that little girl’s voice was also provided Barry. What’s haunting about Barry’s version is the curiosity in the little girl’s voice about what she’d discovered buried at the bottom of the garden and mummy dismissing it as nothing because she didn’t want to be reminded of the bad memories. It was the producer Mickie Most who spotted her talent and suggested covering Come Away Melinda after hearing Barry’s McGuire’s cover of P.F Sloan’s Eve of Destruction which had charted three months earlier. It was a massive departure from Barry’s previous material and although the label states ‘A Mickie Most production’ the song was actually produced by Mike Hurst. Hurst said at the time, “Most must have known it wouldn’t be a success, otherwise he would have produced it himself.” The B-side, Gotta Brand New man was much more in keeping with her previous style and was written by Barry, Hurst and Guy Fletcher. The song became much more popular a decade later when it was discovered by northern soul fans. In 1969 she briefly signed to Major Minor records and released a cover of By the Time I Get to Phoenix, but that went nowhere. In early 1970 Barry turned to session work and can be heard on songs by Elton John, Long John Baldry and Rick Wakeman. In 1972, for one year she became a member of the Les Humphries Singers, a British version of the Edwin Hawkins Singers and then left to provide backing vocals for artists like Bryan Ferry, Cockney Rebel, Andy Fairweather-Low, Tom Robinson and most famously on Eclipse, the closing track on Pink Floyd’s 1973 masterpiece, Dark Side of the Moon. Barry never really received the chart success she deserved and her whereabouts since the late seventies is unknown.